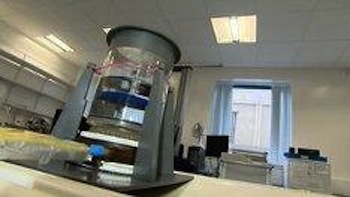 Dundee University scientists announced a machine that can use ultrasound to lift and rotate a rubber disk floating in a cylinder of water. The advance touted here is the ability to turn objects rather than just push them around. They used energy from an ultrasound array to form a beam that can both carry momentum to push away an object in its path and, by using a beam shaped like a helix or vortex, cause the object to rotate. Dr Mike MacDonald, of the Institute for Medical Science and Technology (IMSAT) at Dundee, said: "This experiment not only confirms a fundamental physics theory but also demonstrates a new level of control over ultrasound beams which can also be applied to non-invasive ultrasound surgery, targeted drug delivery and ultrasonic manipulation of cells. "It is an area that has great potential for developing new surgical techniques, among other applications, something which Dundee is very much at the forefront of. "Like Doctor Who's own device, our sonic screwdriver is capable of much more than just spinning things around." Via BBC; thanks to Winchell Chung for submitting the tip on this story.